A comfortable, newly renovated apartment in an historical house on the banks of the river Aude. The apartment is newly renovated and have new beds. Classic France has a traditional style using furniture from the 1800s. It has a 4 m long balcony 3 m high above the garden and offers great views of the town, the river and the surrounding hills. There is direct access to the garden from the balcony. The Garden Apartment is like the garden flowers, lots of different colours. The bedrooms are located off a 6 m long balcony stretching the length of the living area. Great fireplace for winter stays. Access to the garden is via an internal staircase. On the riverside of the property is a wonderful private garden with "dining and wining" areas overlooking the river. A covered outside kitchen gives access to electricity and contains a great wood BBQ. In the middle of the garden is a very old olive tree from the 1880/90s. Other highlights include 2 fig trees, 10 citrus trees, Mediterranean herbs and many rosebushes. Australian researcher / herbalist living in Sweden with a second house in Limoux. I have travelled extensively on many continents and had good idea of what I wanted in a permanent holiday house but finding it was the challenge. I wanted to be close to a variety of restaurants so there would no need to use a car at night; close enough to the centre of town to buy baguettes and croissants for breakfast without starting the car; a water view; a church tower view; a house with lots of French character, close to the nature in a place where the French traditions remain strong. Plus it had be an area where I could go biking and walking. My Swedish wife wanted a garden with rosemary, lavender and mature fig trees. Even demanding dreams do come true. We got it ALL, even TWO mature fig trees! We just fell in love with this area and got The Dream House with the Dream Location. Limoux is a town with a thousand years of history, in an area that was even frequented by the Romans. Limoux offers a base to explore on foot/bike/car the stunning landscape of the Pyrenean foothills. The Aude valley, the home of bubbly, is an area of grand and living traditions. The quality of the farmer markets is superb with organic cheeses, fruits, vegetables, eggs, meats and wines. PLUS very nice local people who are good at sign language when your tourist French fails you. Car vs No Car: Only 20 min. by car from Carcassonne airport or you can catch the train - we are only five 5 minutes from the railway station and 15 min. from the car rental. By car- Toulouse airport 76 min. Girona airport 161 min. Camurac 63 km, Mijanes Donezan 67 km, Ax les Thermes 85 km. .
20 minutes away. Golf de Carcassonne 18 hole. We have an elevator taking 400 kg providing access to the apartment from the garage. The bath rooms are not specifically designed for wheelchair users. Access to the garden and BBQ area is possible via the elevator through garage back entrance. Notes on accommodation: Two bedrooms with individual bathrooms across a hallway one with shower a shower and one with a small bath and shower. Kitchen wooden floors, modern Ikea beds in all bedrooms. Outside: Garden with fig tree, table and 4 chairs. The planting includes aromatic herbs of rosemary, lavender, sage. Roses and other flowers provide more enticing scents and colours. Anna and Michael have created the most beautiful home and a stunning garden overlooking the river and church. This was our second visit for the annual Toques et Clochers wine festival which is great fun. They have thought of everything for a great holiday and made us feel very welcome and comfortable. Highly recommended. Amazing house with fabulous garden beside river and very central. We were in awe at the quality of accommodation in this exceptional property. 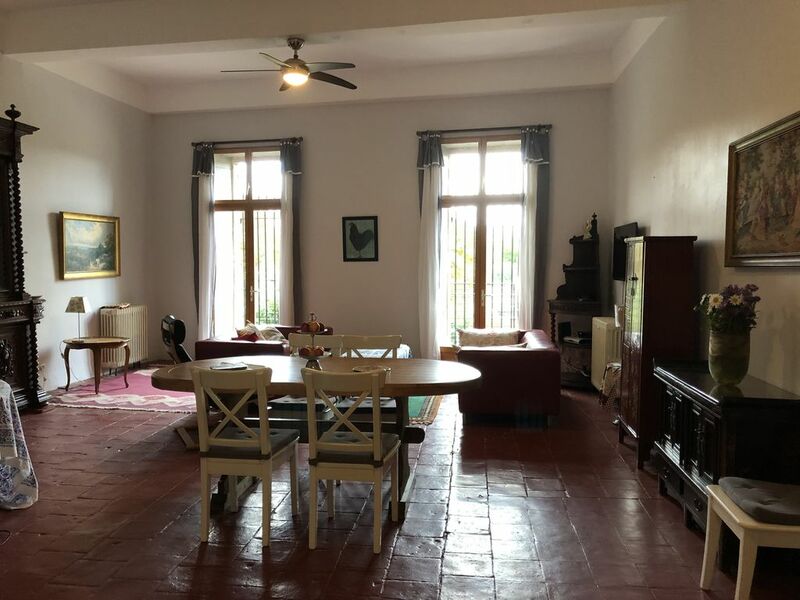 From the street it looks quite an ordinary house but once you climb the stairs the grandeur of the apartment with its high ceilings, original floor tiles and antique furnishings takes your breath away. A very modern and extremely well furnished kitchen with its range cooker and large fridge/freezer makes it very attractive to cook meals indoors instead of going out to restaurants. The bedrooms and bathrooms are beautifully furnished and comfortable with everything you could wish for to give a restful night’s sleep. All the windows take in the afternoon sun and overlook the spectacular gardens laid out with flowers, shrubs, herbs and even fruit trees. There are also a few seating areas as well as a bbq area. This is a peaceful haven to sit in, listen to the birds and hear the river flowing beyond the outer wall. All of this is only surpassed by the hosts, Anna and Michael, who are extremely welcoming and made us feel it was a privilege to stay with them. Their warmth and hospitality as well as their communication with us made our stay here very memorable. They recommended lovely places to visit in the mountains which we would never have found on our own. We would love to have stayed here longer and certainly hope to return at some later stage. We can not recommend this property and it’s hosts highly enough. Anna and Michael are great hosts and have thought of everything to make their guests happy. Lots of considerate touches in a stylishly furnished apartment with a lovely garden. Only a few minutes walk to Limoux town centre with a great view of the river and church opposite, lit up at night. Anna & Michael were very welcoming & sociable (we visited a local wine bar together). There home was very well kept, with a great kitchen for home cooking (double hob/oven, huge fridge freezer, dishwasher etc.) The apartment has its own balcony and access to a private section of the garden with a bbq area, sun lounges & terrace overlooking the Aude. The apartment is located a 5 minute walk around from Limoux Central Station for those who wish to use the rail network. As cyclists, Limoux was the perfect base. The town itself has plenty of grocery stores, butchers, fish mongers, mini markets etc. and a decent selection of brassieres and restaurants. From Limoux we cycled through the valleys eastwards and visited a number of little villages, from Bugarach, Massac, Tornissan, Fontjouncouse and the scenery was beautiful. The terrain can be quite hilly depending on you're chosen route with maximum altitudes of over 800m. Nonetheless, this part of the world is still relatively untouched and the roads/villages were all cycle & hiking friendly. Would definitely return to Anna & Michael's apartment. Y828JK 7-14 Oct 2017.Riverside Apt. Limoux. Roy Fletcher. Delightful location adjacent to and overlooking the river Aude. Spacious, well equipped accommodation with beautiful gardens and above all friendly hospitable and gracious hosts in Anna and Michael who made our stay even more enjoyable. Limoux just 18k south of Carcassonne is a pleasant town with a nice square on the river Aude. It has major supermarkets in Leclerc and Lidl on its outskirts providing all basic needs is and is ideal for exploring the surrounding area with plenty of vineyards available to sample its excellent regional wine. A must visit is the still working Abbey at Lagrasse although, the drive over the mountain road can be interesting albeit a little hairy. The old walled city at Carcassonne is magical and a great way to spend an afternoon as is the Abbey at Rennes-le-Chateaux complete with its myth and legends. A visit to the Medieval town of Foix near Andorra provides a great opportunity of appreciating the charming and diverse countryside. Beziers and the lovely old cities of Narbonne and Perpignan are well worth the 1.5 hr drive. Motorway is easily accessible at Carcassonne. Find time to go the short distance to ‘Alet les Bain’ but take a towel and enjoy bathing your feet in the thermal spa as the locals fill the water bottles. This was a thoroughly enjoyable holiday with plenty to see and do. Some beautiful places and some not so memorable. We look forward to our next visit. 30 minutes by car to Carcassonne and 1.5 hours to Toulouse airport by car You can hire a car in Toulouse but you can also go by train from both Carcassonne and Toulouse to Limoux.